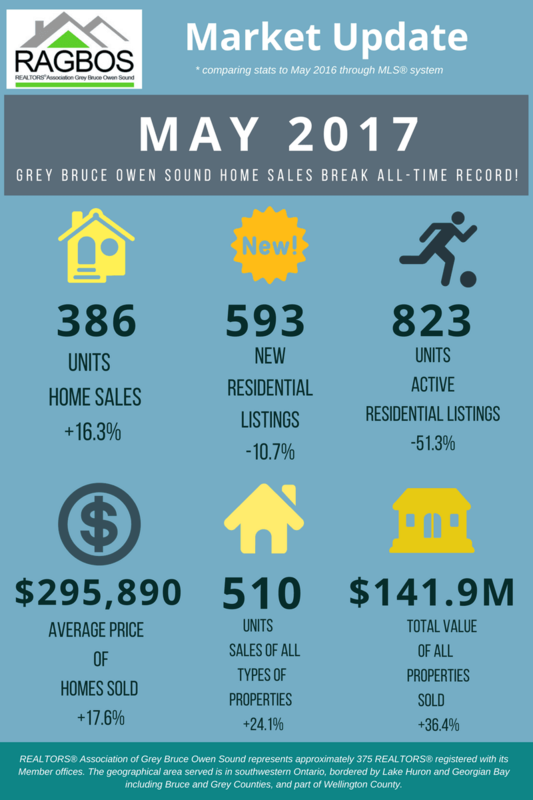 Residential sales activity recorded through the MLS® System of the REALTORS® Association of Grey Bruce Owen Sound rose 16.3% on a year-over-year basis in May 2017. 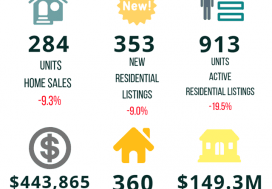 Home sales numbered 386 units in May – a new all-time record. On a year-to-date basis, home sales totalled 1,234 units over the first five months of the year. This was a record for the period, up 12% from the same period in 2016. The average price of homes sold in May 2017 was $295,890, up 17.6% year-over-year. The year-to-date average price in May was $289,453, rising 14.3% from the first five months of 2016. 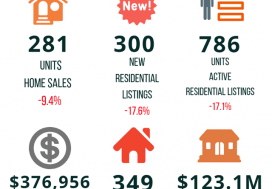 New residential listings on the Association’s MLS® System numbered 593 units in May 2017. This was a decrease of 10.7% compared to May 2016 and marked the lowest level for the month of May since 2010. 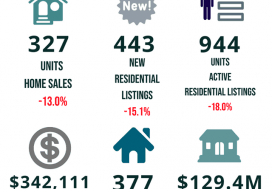 Active residential listings totalled 823 units at the end of May, down 51.3% from the same time last year. This was the lowest level of overall supply since the late 1980s. The number of months of inventory stood at a record-low of 2.1 at the end of May, down from 5.1 months a year earlier. The number of months of inventory is the number of months it would take to sell current inventories at the current rate of sales activity. The dollar value of all home sales in May was $114.2 million, jumping 36.7% on a year-over-year basis. This was a new record for the month. Sales of all types of properties numbered 510 units in May 2017, up 24.1% from the previous May. The total value of all properties sold in May 2017 was $141.9 million, rising 36.4% from a year earlier.